Herman Miller never fails to come up with something rivetingly different. To quote Charles Eames: “Toys are not really as innocent as they look. Toys and games are preludes to serious ideas.”. This is a philosophy the team at Herman Miller hold dear to the heart – play is the inspiration behind many of its products. 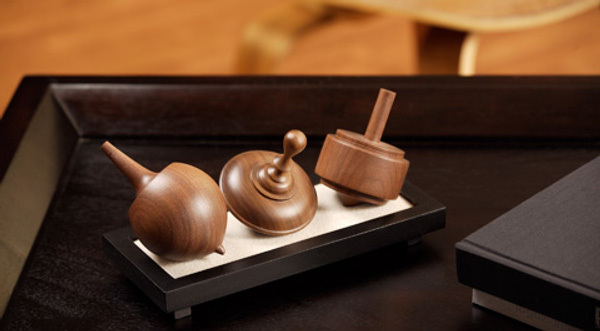 These beautiful walnut spinning tops are fit to inspire design professionals and children alike with three different sculptural designs in the set. 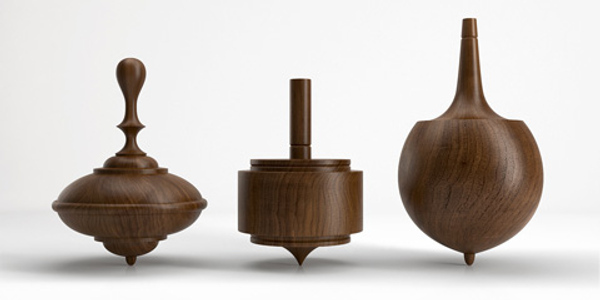 A spinning top can take me to another world for one absorbed minute, with its all at once slow motion, yet quick-moving dance. Elements of play can also be seen in the Hang It All and RAR Rocker, featured here earlier in the year. Herman Miller releases a ‘Select’ object once a year which is always limited edition. The Tops will be available until mid-April 2010 – see stockists for where to buy.